Merge social media with books and you get the fantastic site Goodreads.com. If you love books and you aren’t on goodreads yet, what are you waiting for? 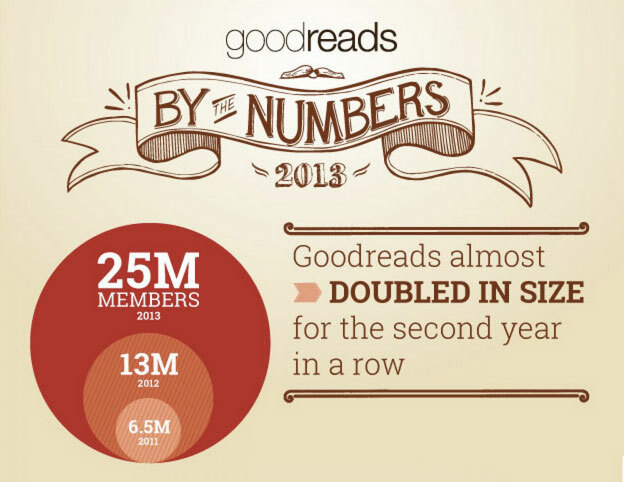 With 25 million members, Goodreads is THE place online to discover and review books. Every day I love reading my goodreads news stream filled with all my friends’ activity talking about books. Amazon acquired Goodreads in March 2013. There was good news and bad news from Amazon buying Goodreads. One year before that happened, I predicted an Amazon and Goodreads partnership. Goodreads is a great place to ask your friends what a book is about. 1) Goodreads doesn’t have an area to share how you discovered a book, but there are other ways of recording that information. 2) We are waiting for Goodreads to show your own posts in your news stream.